The elevator pitch: Adventure and intrigue in the time of the Tudors, with MAGIC! In the mid-1980s the Fighting Fantasy phenomenon kicked off and caught the attention of gamers and newcomers alike. The concept meant that you could enjoy fantasy and science fiction adventures with more interaction than simply reading a book, but you didn’t need to have a whole group of friends round like you did with Dungeons & Dragons. Ian Livingstone and Steve Jackson, having already revolutionised the role playing hobby in the UK with the founding of Games Workshop, had struck another rich vein of potential with solo gaming. Keen to take advantage of the wave of interest, Penguin books sought out new books to capture the same audience; and, a 16-year-old with aspirations to write had just suggested the possibility of cramming a whole role playing game into a single, simple paperback volume. Maelstrom presents a whole game packed into a single paperback volume, slightly larger than a Fighting Fantasy game book – closer to the format used by Corgi when they repackaged Tunnels & Trolls or the Cretan Chronicles published by Puffin, also in the mid-1980s. The book provided all the guidance and mechanics you needed to get the game running for the first time, with numerous atmospheric line drawings and an evocative painted cover image of travellers facing off against armed and armoured guardsmen that spoke volumes about the potential adventure ahead. The game uses both six-sided and ten-sided dice, so presupposes that the potential audience would have either tried role playing before or have access to a store that sold ten-side dice (though, you could always improvise with a pack of cards, stripped of royalty). The essential mechanic of the system, the Saving Throw, boils down to making percentile rolls versus a specific attribute, with a value equal or less indicating success. The average character starts with a score of 30 in all abilities, so you need to roll 30 or less on the roll of a d100. Core attributes, somewhat oddly, include both raw abilities, like Perception and Endurance, as well as learned, and quite narrow, abilities like Attack Skill and Defence Skill. In the basic version of the game, the player tests abilities with Saving Throws, either to simply roll equal or less for success or to succeed while an opponent fails in a conflict situation. A character can achieve incredible degrees of success with either a roll of 5 or lower (a critical success) or a roll of 95 or above (a critical failure). Age, an element of the character generation system, sets a ceiling on the upper limits of abilities. A quarter of the book, both in the player and Referee sections, deals with the Livings that shape what a character has done before the first adventure begins, the shape of their live, background, and education. A character might be a Noble, Professional, Craftsperson, Trader, Labourer, Mercenary, Rogue, Priest, Travelling Player, Mage or Herbalist. The choice determines the length of their apprentice, their key attributes, special skill-related crunch, and equipment. Alexander Scott wrote the Maelstrom combat system to embrace the brutality and lethality of battle. The player records each wound sustained separately, and in turn must recover from each separately. Moreover, in the extended Advanced rules a character can suffer bleeding from serious wounds or special, and serious, wounds from sharp or blunt weapons. A final key element that sets the game apart from the otherwise pure historical setting is magic. Scott wanted to include something flexible and easy to manage, that didn’t require constant reference to spell lists but would add an important supernatural something to the setting of the game. The Maelstrom represents a chaotic and otherworldly force from which magic – the means to subvert and distort reality – comes. Through a combination of Knowledge – knowing the right incantation – and Will – having the strength to bind magical forces into material form – a Mage could create almost any effect. However, the greater the shift in reality, the harder the Mage need to work to form and control the spell. Aside from the cover and internal art, plus a brief mention of the intended sixteenth century period, the background for Maelstrom extends to just three pages – the Lie of the Land. However, in terms of guidance and setting, the two adventures in the book, one solo and the other group targeted, further expanded on the background, but only tangentially. Effectively, the game depends on the Referee and players to know anything at all about the Tudor period, which might have been a reasonable assumption given the target audience of school children keen to get into gaming for the first step. The Livings provide a point of view, a little window into the past and the sort of people populating it; but the book never comes over as a historical textbook or a guide to the reign of the Tudors. In many ways, the Setting comes over as implied rather than implicit. On the other hand, that very subtly, the approach of weaving the background around the adventures, the examples, and dotted within the text, means Maelstrom never comes across as a dry read. A player picking up the system for the first time doesn’t need to feel that the game they play has to be set in any particular historical time period – anytime when you might have wielded a sword and shield will suffice. The book contains reference to using the game for completely different periods, including science fiction, and the system might very well be simple enough to make that a possibility. Really, out of the box, the rules provide material and mechanics to support gaming in history, and I’ve used it to run games in other centuries further back into the Medieval period and the Dark Ages. While the background for the game might have been scant, leaving it very much up to the Referee to know something of the proposed sixteenth-century Tudor backdrop, the book did provide a wealth of material specifically to support the Herbalist character. Spread across a dozen pages, the Maelstrom book detailed sixty-one herbs with both medicinal and insidious purpose. While Alexander Scott had specifically avoided providing spell lists so as not to detract from the essentially historical background of the game or demand constant reference to the rules, here he provided a herbalist’s equivalent with entries ranging from the powerful and expensive All-Heale, through to the esoteric Mountain Setwall that grew hair on the eyes of the unsuspecting. The game originally appeared in 1984 and sold well enough to have a fresh print run in the following year. The publisher also had a translation made into Japanese. Despite the relative popularity of the book, Maelstrom received no particular publicity and no additional books followed. For more than 20 years, the only source for those interested lay in the secondary market, with copies selling for anything from £10 – £20. In 2008, Arion Games acquired the rights to publish the book, selling a scanned PDF through online sites and a bound volume through Lulu – and, more recently, Cubicle 7. Since then, Arion have self-published. The Maelstrom Companion – A volume that extends various elements of the core system, including new livings for characters, new character details, information on using firearms, alchemy, alcohol and surgery. The book also includes chapters on campaigns, expanded magic, the Church, and the town and population of Bury St Edmunds. The Beggars Companion provided a detailed extension to the system for running games with a wide variety of vagrants and scoundrels, including a full adventure. Maelstrom Quarterly – of which two editions have been released. The first dealt with Tournaments; and, the second issue covered Inns and Taverns. More recently Maelstrom Domesday revamped the system with life path character generation and a new setting in 1086, focussed upon investigstors of the supernatural. Maelstrom Gothic has now gone a step further still, bringing the focus into Victorian times… But the supernatural and the distorting power of the Maelstrom remains ever present. There are several adventures – ‘Strange Days in Nayland’ that deals with the investigation of a curse, ‘The Sward and the Stone’ where the characters help a merchant transport a wagon of goods from Swansea to Pembroke, a load that includes an oddly engraved stone, and more. Arion Games has a Maelstrom section on the site, runs a forum, which includes a section for Maelstrom, and also sells a Maelstrom-themed set of paper miniatures, for those who like to have a battle mat or a point of physical reference for their character. Quite often when a person remembers Maelstrom at all, they remember it for the extensive herbal or the novel and flexible magic system that always reminds me, at least, of a savagely stripped down version of that used in Ars Magica. 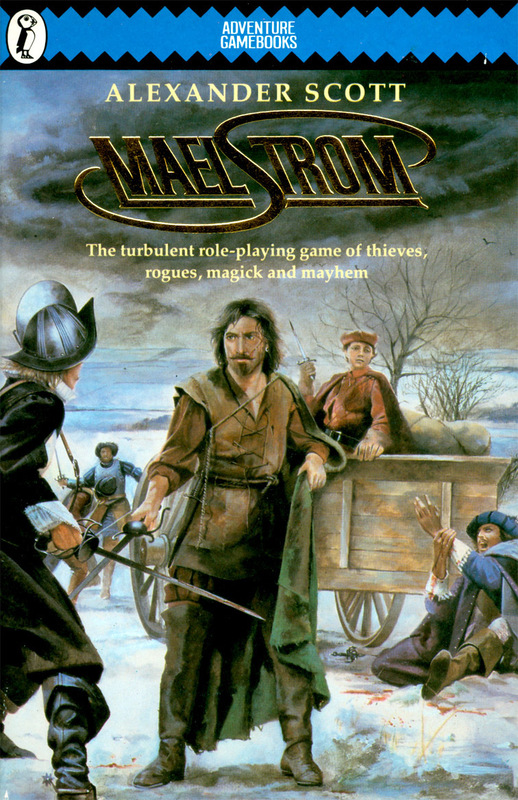 Maelstrom embodied a game that included more complexity than a simple game book without overpowering with multiple manuals or reams of reference. I have obviously given specific reference to the herbal already, but this little slice of reference has served me time and again as a quick point of reference. A simple, effective piece of flavourful fluff that both supports one of the character options, but also gives a little colour for the game setting, too. Here in just 295 pages you have a simple game, a mini-solo game book, a group adventure, a herbal (yes… again! ), and quite a bit of crunch and guidance – a book that could fit in a coat pocket. At the time it cost £1.95 – and now it doesn’t cost a great deal more. In the mid-1980s, Maelstrom represented incredible value for money and an ideal stepping-stone up from Fighting Fantasy and its ilk. Despite relative success, the game never got the support it deserved on its original release. Now, Arion Games have got the chance to correct that somewhat – but at the time the Referee had nothing else to fall back on. In many respects, the system was undeveloped. Fitting the whole thing in the format of a paperback book meant a sacrifice had to be made. The lack of a more extensive historical background in a historically based game pays obvious testament to this lack of space. Scott himself has admitted that he couldn’t imagine anyone using the system exactly as written and he felt his system for combat didn’t quite work. And it’s true. Every time I come back to Maelstrom I find something that I would tweak, twist, or completely rework; but I wouldn’t change everything, as the core rings true. And now you have the chance to grab the whole lot – a bundle of classic simplicity that has weathered the ages. Well worth a look – but beware the pull of the Maelstrom. Pick up the whole game – including the brand new Maelstrom Gothic – on Bundle of Holding now. Originally published on RPG Geek, October 2011.